Tran Sport tunnel boats are 100% fiberglass, hand-laid and designed to handle Texas bays and surf. Numerous fishing guides have contributed to the design of these boats, and now use Tran Sport boats themselves. 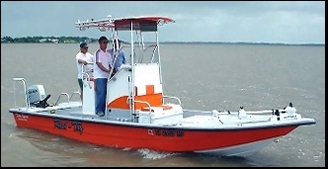 The Texas Parks and Wildlife Department also uses Tran Sport boats. Click Here to Visit our Showroom! 475038 Visitors Have Seen Our Boats. Copyright © TexasSaltwaterFishing.com. 1997/2018 All rights reserved.